UFCW Members Help to Elect Barack Obama! This was UFCW President Joe Hansen’s message, summed up by a simple statement, in yesterday’s Huffington Post article, “A Clear Choice for Workers“. President Hansen couldn’t have been more on the money. Citing Vice President Joe Biden, who spoke to UFCW members this past Thursday, President Hansen pointed out that there has never been a clearer choice for workers in a presidential election about which candidate will stand up for them and fight for their rights alongside middle class America. This year, a fed up and frustrated public supported tea party conservatives in several states, and once elected, these officials began a blatant attack on workers with “right-to-work” acts that aimed to take collective bargaining off the table, and threatened unions of all sorts, making the ability for teachers, firefighters, medical workers, and scores of other public employees to have a voice on the job virtually impossible. President Hansen points out that the politicians who worked so hard to pass these type of actions, did nothing to create jobs. Electing Mitt Romney as our next president would only mean more anti-worker policies, when our country is in need of more, quality jobs. President Obama on the other hand, has proven to be a job creator. When Romney says he will go after union bosses, President Hansen says, he is only threatening a cashier, or grocery bagger, or construction worker, or teacher who was brave enough to stand up and form a union and have a voice. If you are undecided about who to vote for today, read Joe’s message and do what’s right for working America- vote for four more years of President Obama. In the last glimpse at job growth before tomorrow’s election, the numbers showed a modest increase in the month of October, with the unemployment rate now at 7.8 percent. On Friday, The Labor Department reported that 171,000 jobs were added, in a wide variety of career fields. These latest statistics mean that during President Obama’s four years in office, there has been a net gain in jobs. If this isn’t enough proof for conservative officials who claimed that September’s statistics, that showed the unemployment rate had fallen below 8% for the first time since since the President took office, were a fluke- then we don’t know what is. It’s evident now more than ever that our president is a job creator. The recovery process is slow, and there is still much to be done- like increasing stagnant wages and providing more full time work- but the choice is clear. Go out tomorrow and vote for the working class. Last night, Vice President Joe Biden spoke to over 50,000 UFCW members who called in to listen to him at a telephone town hall meeting. He talked about the importance of this election for working families, and the need to get out and vote for the candidates that support working people in this country. Listen to the full remarks here: Joe Biden Telephone Town Hall – November 1, 2012. Once you’ve voted, let your friends and family know! 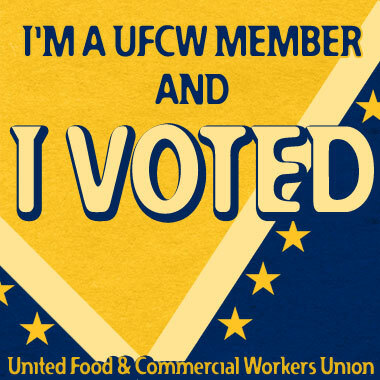 Share this button on your Facebook page today and show your UFCW pride. Early voting has already begun in many states! Why wait until November 6th when you can vote today? Avoid long lines at the polls and other potential issues, and make sure you make your voice heard in this important election. Click here to use our early voting calendar and find out when, where, and how you can vote early in the next week! Why is this election so important? 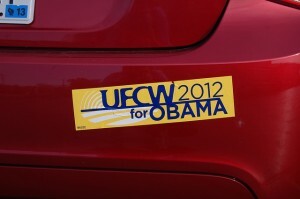 Because President Obama is pro-worker, pro-union, and pro-middle class. Mitt Romney has made it his agenda to get rid of labor unions as we know them, and supports right-wing policies that will only make it harder for workers to have a voice on the job. So vote to stand up for your rights. At last night’s third and final presidential debate, Mitt Romney once again demonstrated that he is willing to say anything to get elected, and his shifting positions on domestic and foreign policy and willingness to lie and pander have raised questions about what he stands for and how he will govern. Our country can’t afford to go back to the Bush/Cheney policies that proved disastrous here at home and abroad. President Obama is the only candidate with the vision and experience to lead our country in the right direction—forward. 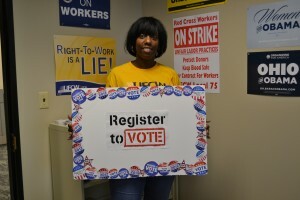 UFCW members have been kicking it into high gear! Across the country, members and their locals are working hard to ensure that working families’ voices are heard in this election. In Kentucky, union members and others in the community are supporting Democrat Charlie Hoffman for the 62nd House District. Up until two years ago, Hoffman had effectively represented his jurisdiction since 1997, but was edged out in the last election by newcomer Ryan Quarles. Voters who sympathize with workers rights know that bringing back Hoffman is the right choice. Having spent years as a career meat-cutter at Kroger, Hoffman knows what its like for the average American worker, and puts those values first. When he was in office, he proved to be an effective legislator, capable of working across party lines, and pressed for laws that benefited small farmers and other local workers. The incumbent Quarles however, has not passed any such laws, and has not proved himself to be an advocate of working Americans. In Michigan, union members are from across the state are drumming up support for Proposal 2. Currently, Michigan state law requires public employees to pay 20% of their healthcare costs, a policy that highlights how the public sector has been shifting healthcare costs on to its employees. Also, collective bargaining is limited for many workers, making the ability to fight for fair wages and safe equipment, among other things, very difficult. If Proposition 2 is approved this year, it will help to protect jobs and families. UFCW members like Kristy Geldersma, an employee at Meijer have been out door knocking and phone banking to build support for this legislation that will strengthen the ability for unions to collectively bargain. On October 9th, Obama supporters gathered for a rally in Dayton, Ohio. UFCW Local 75 and 1059 members were in attendance, along with many others, to support candidates like State House Rep. Roland Winburn. The candidates support keeping jobs in Ohio and also investing and expanding vocational and technical training in the state to keep Ohio’s workforce competitive and growing. 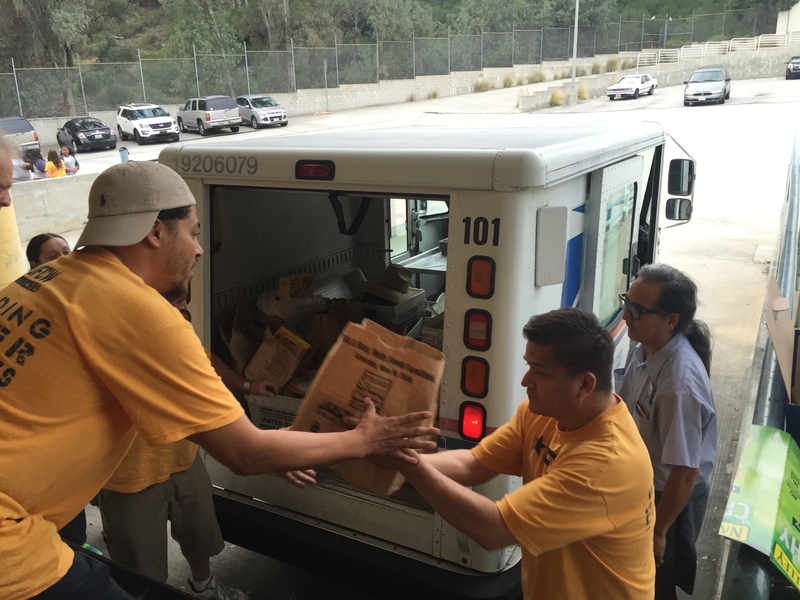 Continuing the support after the rally, members canvassed in nearby areas. Their message was about their main goal: to not become a right to work state. They’re also reminding their friends and neighbors that President Obama is standing up for people to have a union voice on the job, while Mitt Romney does not support people having a voice at work. Last night’s presidential debate at Hofstra University shed more light on Mitt Romney’s evasions, contradictions and outright lies about his position on policies that affect the poor and middle class. Once again, he tried to portray himself as a man who empathizes with working families, but, as President Obama pointed out, Romney’s extreme positions on education, immigration, taxes, pay equity and health care tell a very different story. Romney and his running mate, Representative Paul Ryan, have made it clear that they intend to make significant cuts to K-12 education, as well Pell grants and job training. They are against comprehensive immigration reform. They do not support the Lilly Ledbetter Fair Pay Act and and want to repeal “Obamacare” and take us back to the days where people are denied coverage for pre-existing conditions. The only groups benefiting from the Romney/Ryan plan are the wealthy few—whose taxes would be cut even further — and corporations, which would receive tax breaks for shipping good middle class jobs overseas. Talk about flip-flopping. Meanwhile, President Obama spoke eloquently about his vision for bring not just any jobs, but good paying jobs back to America. We can’t afford to go back to the same old trickle down policies that got us into this economic mess in the first place. This debate made it clear that President Obama is committed to making life better for working families and our most vulnerable citizens. Hot off the presses: it’s the new Picketman video! Mr. Picketman, everyone’s favorite labor rapper, has an important message for his fellow UFCW members: We can’t afford to let Romney win in 2012. Get out and vote! For those of you who don’t know Phil Meza, a.k.a. “Mr. Picketman,” the UFCW Local 1428 member got his nickname during a rally one day, after he scrawled out a song on the back of his picket sign – a song he would soon lead the crowd in singing. Music has been a lifetime hobby for Picketman, but, throughout his 20 years as a union member and Albertson’s employee in Southern California (where he served as a department manager for years, and then as a front end service supervisor) he’s developed ideas for songs that he could use to help further the fight to protect working families. This week’s decision by a Pennsylvania judge to halt the state’s new voter identification law, ordering that it not be enforced for the presidential election, is a step in the right direction. Voter ID laws target those who are least likely to have photo IDs or to be able to afford any, and make it harder for people—including minorities, seniors and low-income voters—to exercise their right to vote. With the election just five weeks away, the ruling by Commonwealth Court Judge Robert Simpson means that voters in Pennsylvania will not be required to show photo ID at the polls on Election Day—making it easier for all eligible Pennsylvanians to participate in this important election. Pennsylvania is a swing state with 20 electoral votes up for grabs. According to recent surveys compiled by RealClearPolitics, President Obama is leading in statewide opinion polls by an average of 8 points. Mitt Romney: A Man of the People? After dismissing half of the American people as “victims” at a private fundraiser in May, it’s amazing that Romney would try to hoodwink middle class and low- income voters into thinking that he cares about them. In last night’s debate, Romney tried to portray himself as a man of the people and said that he would not raise taxes on middle-class families or reduce the share of taxes paid by the wealthiest Americans. Don’t be fooled. Romney and his and his running mate, Representative Paul Ryan, have made it clear that they are planning to pay for more tax cuts for the wealthy at the expense of America’s workers and the poor. They want to make significant cuts to programs that serve the poor and middle class—including cuts to K-12 education, job training and grants which help kids go to college, replacing Medicare with a voucher system that would increase health care costs for seniors, and gutting Medicaid for the working poor. The only groups benefiting from the Romney/Ryan plan would be the wealthiest Americans—whose tax cuts would be permanent if Romney and Ryan have their way—and corporations, which would receive tax breaks even as they continue to ship good middle class jobs overseas. With the election only five weeks away, America’s workers face a stark choice between an opportunist who favors the wealthy one percent at the expense of the young, the elderly, the sick and the poor, and a leader who has given a voice to those who are too often overlooked and is fighting to create jobs and prosperity for all Americans. Voting in Ohio is underway!